The Holidays are fast approaching and that usually means two things for non-profits. 1. The nature of the Season gives rise to people’s generosity BUT 2. they also want to give (and get) wrapped gifts. So they look for ideas where they can benefit those in need while walking into the office party with an actual present at the same time. In maintaining the work of Nazareth House Apostolate, St. Simeon Skete and the mission outreach in Sierra Leone, your prayers and donations are always essential. The needs are not limited to Seasons or Holidays. They are ongoing. However, during the Holidays, many times people get caught up in the “gift giving” dilemma and forget their commitment to the disadvantaged, sick, and hungry in an effort to buy a gift for all their relatives, friends, etc. And though this ought to be a time of heightened spiritual awareness, that sometimes gives way to the glitter and glitz of party, family and fun. There is nothing wrong with those things in and of themselves, but with neglect of “The Shema” the world gets out of whack. Another festive season is on its way and Nazareth House Apostolate is hoping to be remembered as you plan your holiday gift giving. The NHA Board Members and staff are doing all they can to provide for the needs, but we depend on God as he expresses Himself through your generosity. I don’t particularly have an opinion about Henry Ford, good or bad, but he did say "Business is never so healthy as when, like a chicken, it must do a certain amount of scratching for what it gets.” Well, our hens at St. Simeon Skete have done some scratching around and hatched an idea to help provide for the needs and award you with a bonus gift as well. 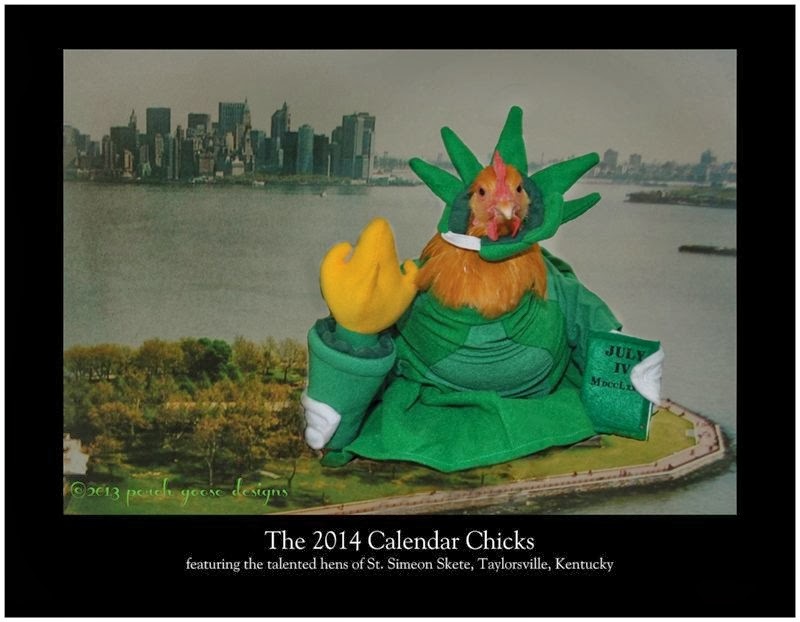 Introducing the talented “fashion model” hens of St. Simeon Skete and their fundraising project: The Calendar Chicks 2014. Each “model” hen worked hard during every photo session - although spoiled as they are, they also enjoyed some finer treats. 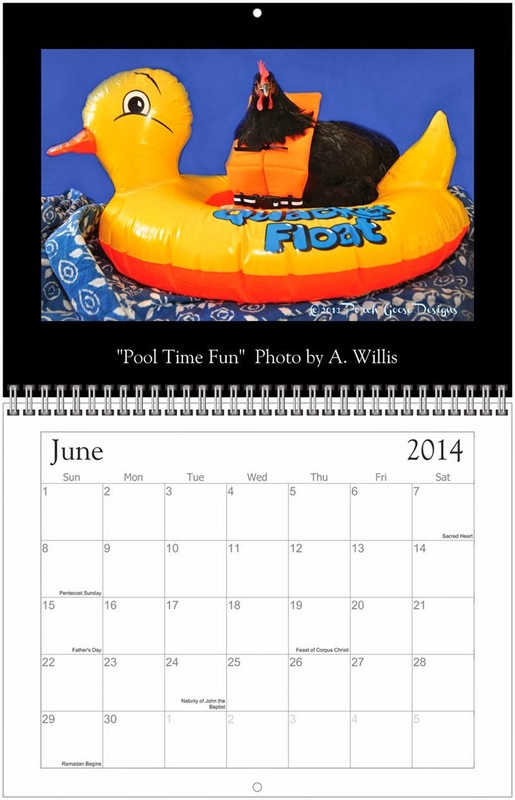 and especially Aleica Willis along with Jenna, Kelsay and Leila; Joan E. Markwell, Samuel and Lucas Peterson, Melody Dennison and James B Mansaray for all of their help in making this calendar. It was not an easy endeavor, but it was interesting and fun. 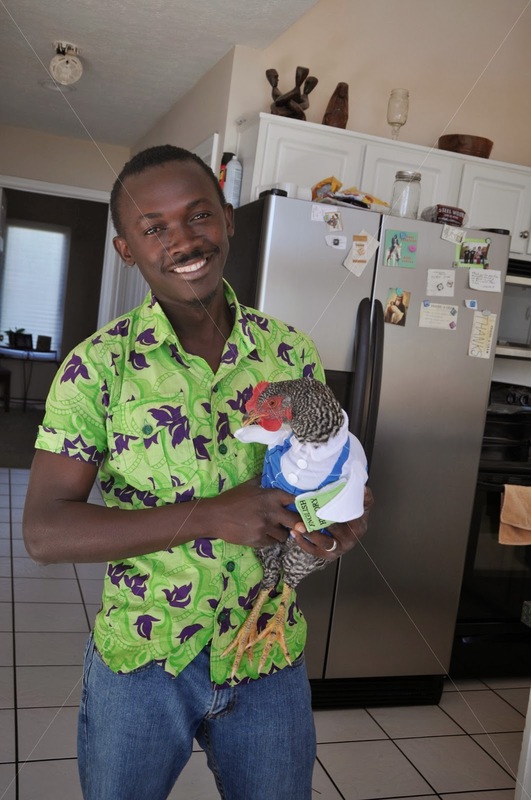 And to this day I still break out in a smile when I think of the faces my daughter Melody made when a chicken would poop in mid photo shoot. So where did this idea come from? When I was a teenager, my mother had a concrete goose that she sat on the front porch. Every Season, every Holiday, she dressed that goose in different outfits. As a child I loved this but as I grew older, I was totally embarrassed by that ridiculous dressed up goose and was ashamed for my friends to see it. I was the youngest in the family and I believed I was “very grown up”. What would my friends think of me? Would they think that my mom decorates fowl on the porch for me? 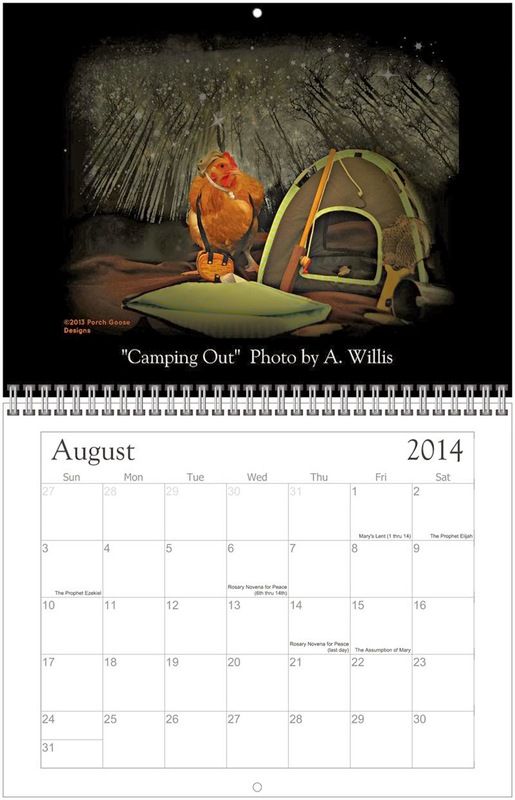 Raising Chickens at the skete, I decided to share my mom’s whimsical spirit and throw some clothes on a few of the hens and make this calendar to benefit the work of Nazareth House Apostolate. 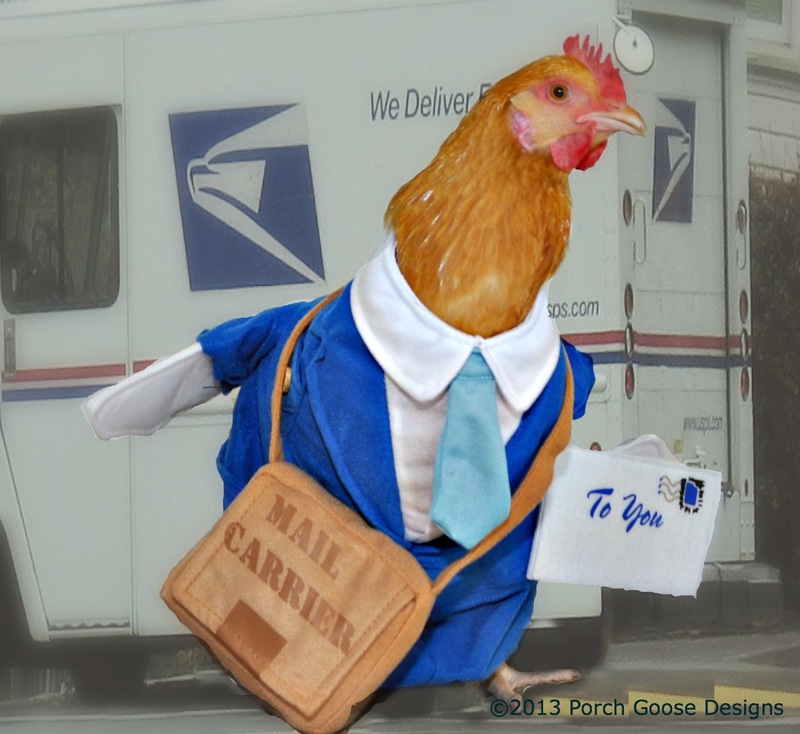 Porch Goose Designs is a media/fund raising division (like the Trappist sell cheese) of NHA. You’ll hear more from this division in the future. 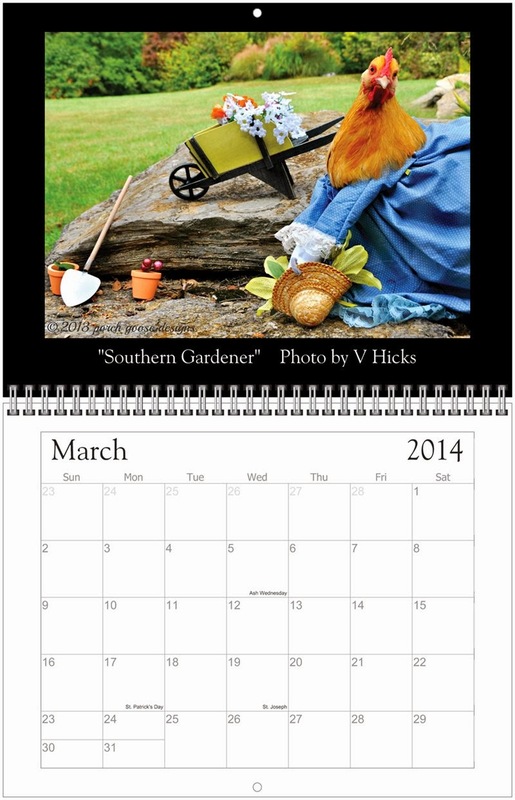 However, our initial project is this adorable calendar. Every calendar is $25. 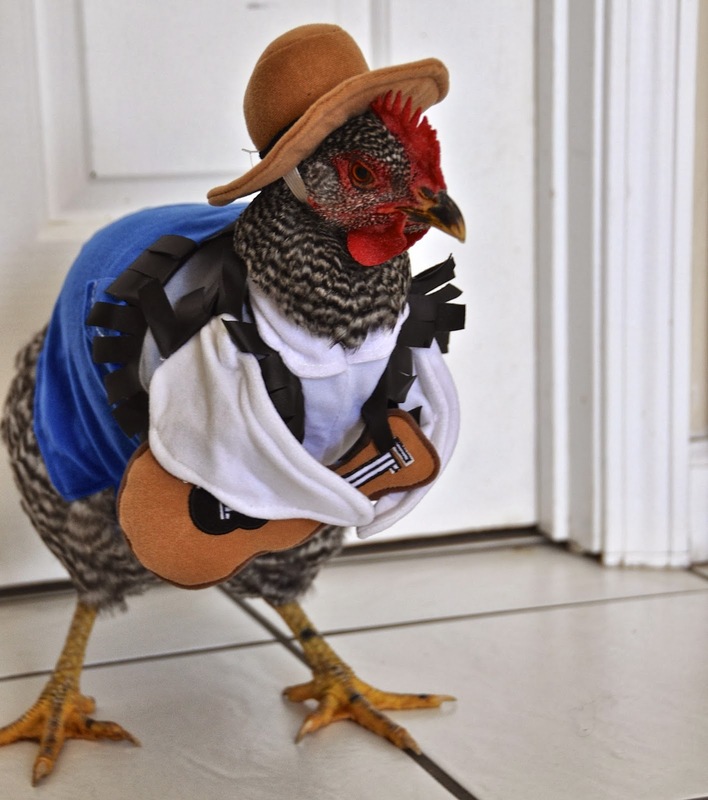 Sounds like a lot of money, but if you leave off a few stops at the local Coffee House or take your lunch instead of buying out its “chicken feed” (henhouse slang for “small amount of money”) - you won’t even miss it ...AND you’d be donating to a worthy cause ... Plus getting a calendar. Have a look! Buy one (or two or three or...) today. What a conversational piece! 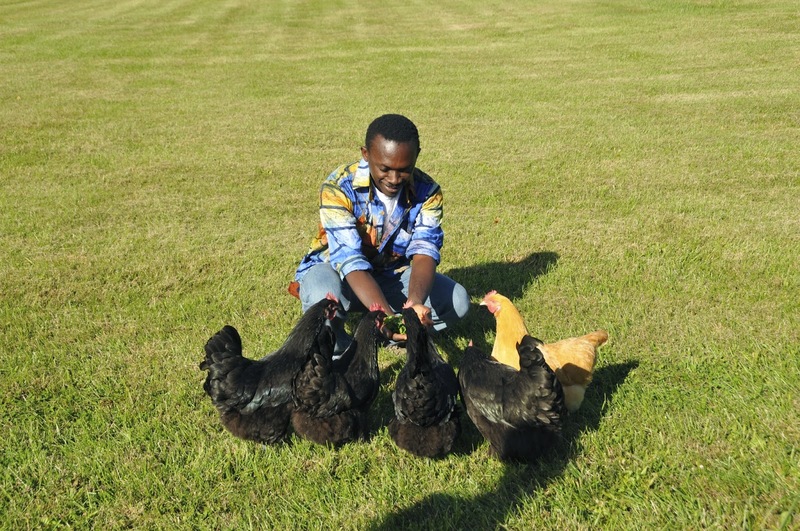 - you’ll be able to laugh at the chickens all the while you are explaining the good work of Nazareth House Apostolate.